The Absorbing Man on the path to redemption? Hulk battling his father for control? The Big Green One’s supernatural enemy revealed? 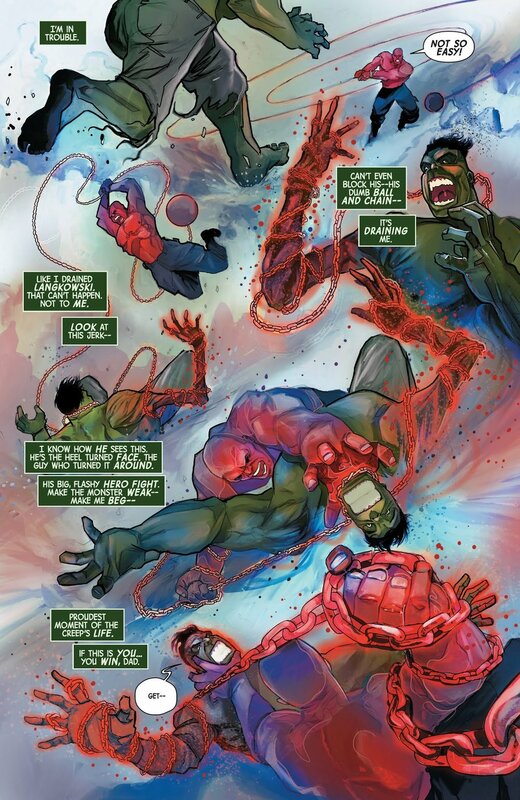 All that and more are in The Immortal Hulk #9, written by Al Ewing, with art by Martin Simmonds on the Creel pages, and pencils by Joe Bennett, inks by Ruy Jose, and colors by Paul Mounts on the Hulk pages. Previously, Hulk tangled with Sasquatch in a small town and was tricked into absorbing a supernatural entity that claimed to be his father. The brawl alerted government officials, which ended up in a brutal battle with the Avengers. When they managed to defeat him, he was whisked away to the mysterious Shadow Base and experimented on. Eventually, he escaped, killing the lead scientist in the process, and was free to roam the country again. Now, it is revealed that Carl Creel, aka the Absorbing Man, was recruited out of prison by Shadow Base weeks ago, given one last chance to do something worthwhile with his life, and souped up in order to fight the Hulk. Meanwhile, old Jade Jaws is being drawn back to his “home,” the base where a gamma explosion first changed Banner into the monster, but he’s not sure if he’s being manipulated by his father or not. Ewing’s story, in general, just keeps getting crazier and crazier. Considering this iteration of Hulk’s book started out as a series of one-and-done issues establishing Banner/Hulk’s new status quo as “immortal,” to see where it is nine issues later is mindblowing. Hulk has gone from handling a robbery in the first issue to fighting an out-of-control Sasquatch, being possessed by his dead father, being cut into pieces, and is now tangling with an augmented Absorbing Man, and that’s all happened in one big megastory. Ewing really knows how to give readers a bang for their buck, and he’s managed to step up the excitement factor in almost every issue while building a mystery around the Hulk, Banner, and their unknown, otherworldly nemesis. This is comic writing at its best. It would be criminal not to mention the B story in this issue, which revolves around the Absorbing Man trying to make the right choices in life after being incarcerated for making the wrong choices for the millionth time. Ewing handles this character well, because Creel is clearly a criminal at heart, but he’s also realizing that hasn’t really ever gotten him anywhere. He has a wife that wants a better existence for herself, and he’s in prison because he wouldn’t listen to her. Now he’s gotten an opportunity to get out of jail with a legitimate offer from the government, but it starts going sideways almost immediately. By the end, Carl’s story dovetails into a horrific cliffhanger that is Twilight Zone-esque in its twist, reminding him that no matter how much he might want to change his life, he’s a bad person that has done a lot of awful things, and he’s got a special place in Hell waiting for him. There are also hints at the true villain behind everything in this chapter, previously only glimpsed when Banner’s dad showed up claiming to be working for someone else. Now readers are treated to the supernatural entity actually showing its face (kind of). They’re shown an image, and the villain talks to Creel, but it says he is only seeing a mask. This, of course, raises more questions, like why would this entity need to hide itself from Absorbing Man, but it’s the most Ewing has shown us so far, so it’s worth getting a little excited over. Bennet, Jose, and Mounts, the usual art team on this book, do a stellar job, as usual. They are, quite frankly, one of the best all-time Hulk art teams in the history of this title. Fortunately for the readers, they are also given another artist to dazzle them this issue. Simmonds masterfully handles the Creel side of the story, which mostly consists of flashbacks leading up to his duel with Hulk, but his scenes are heavy with atmosphere and really humanize Carl. If Simmonds wants to draw a new version of Thunderbolts with Absorbing Man on the team, Marvel should jump at the offer (just a suggestion). Overall, this is another slam dunk issue from Ewing and company. Even though it started out slow, this story has hit a breakneck pace in a matter of a few issues, and it only gets better as it goes. Even with half of the issue focusing on an old villain that the Hulk has defeated many times, the story is still compelling, and honestly, one of Marvel’s best books out right now. Run, don’t walk, to pick up this series today.